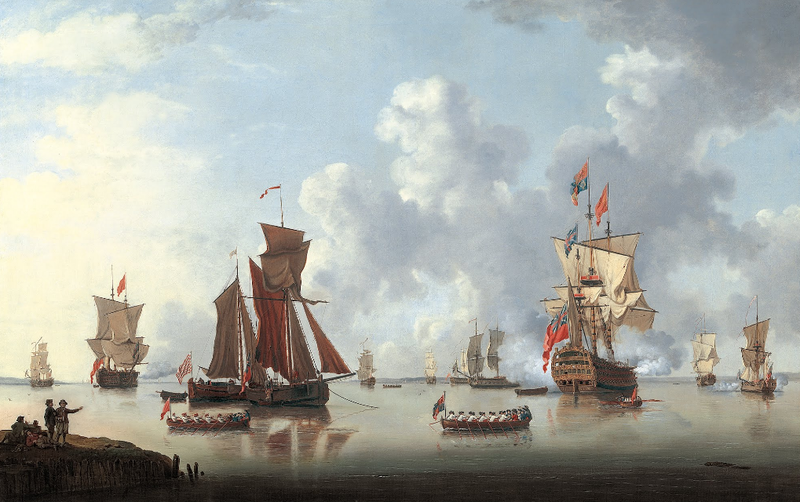 "The Landing of the Sailor Prince at Spithead," Francis Swaine, 1765, Art Gallery of South Australia via the Google Art Project. Though neither the Art Gallery of South Australia nor the Google Art Project give us any indication of who the sailor prince is, a simple glance at the royal family of 1765 turns up the answer fairly quickly. Prince Edward, the Duke of York and Albany, was the only immediate relative of the recently ascended George III to serve in the Royal Navy. The Duke climbed quickly to the position of Vice Admiral of the Blue, a position he would hold until his premature death in 1767. The Duke is heading ashore on a barge bearing the royal colors, to a salute fired from a ship of the line festooned with the royal colors, king's colors, and a red flag with a gold fouled anchor. Watching with only a passing interest, a few fellows ashore relax with their dog, pipes of tobacco, and a few drinks. Given the short brims on their hats, the lack of collars on their short jackets, the walking stick held by the chap on the far right, and the petticoat trousers/slops that most of them wear, it is with confidence that I label these men sailors. 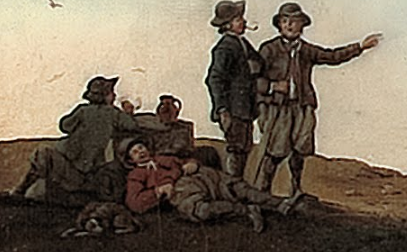 One of them is clearly wearing breeches, which appear to be brown. The sailor sleeping beside the dog wears a red jacket or smock. Two sloops sit in the calm water. One bears the red ensign (used by both the red squadron of the Royal Navy and merchantmen), and the other a flag with thirteen alternating red and white stripes. This ensign was later used by the Continental Navy, but in this case probably represents the East India Company, whose colors are almost indistinguishable from those of the rebel fleets early in the American Revolutionary War. The sailors aboard the sloops wear short jackets of brown, blue, and red, knit caps and round hats, and petticoat trousers/slops. With a solid red ensign at the bow, the barge in the foreground is manned by oarsmen in white shirtsleeves and jockey style barge caps. Interestingly, the barge caps are bright red. 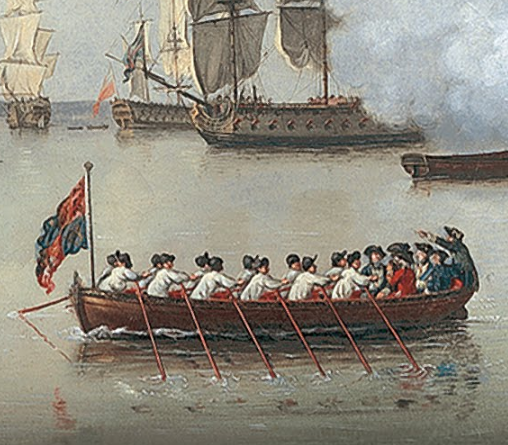 Astern of the barge is another, this one bearing the Sailor Prince and his entourage, including what appears to be a marine officer in redcoat and untrimmed black cocked hat. The oarsmen here wear shirtsleeves just like their counterparts ahead, but their barge caps are the more traditional black.